The Hamm DV+ is available as a tandem roller with double vibration drums or with oscillation and vibration drums, and also as a combi roller. In 2017 Hamm launched the line in North America with the DV+ 70i VO-S model weighing 7.7 tons (7 metric tonnes). These highly productive, pivot-steered rollers represent the pinnacle in asphalt compaction, and meet all requirements for optimum compaction quality. Hamm says that operators are enthusiastic about the excellent visibility and the new, intuitive Easy Drive operating concept. Construction companies and roller drivers will find everything they would expect from a modern roller in the DV+ series of tandem and combi rollers. The DV+ is economical to use, easy to operate and designed for maximum productivity. An intelligent drive control – plus pivot steering with four steering modes and large turning angles – form the basis for the highest possible compaction quality. The design is well thought out, enabling an excellent view of the drums and the work environment, an important point when it comes to getting the smoothest mats and satisfying the strictest quality and safety requirements. With the DV+, surfaces can be quickly compacted to a high standard because all components in these rollers are perfectly matched to one another. An important factor is the always evenly distributed weight of the DV+. This is due to the positioning of the engine in the centre of the machine and the two-part water tank distributing the weight evenly in all operational states. The standard split drums fitted as standard feature vibration, and represent a further plus factor for quality. They ensure perfectly compacted asphalt layers, even in tight curves. There is also a very large turning angle, and the enormous track offset of the pivot steering allows the DV+ to be steered with great sensitivity in four different steering modes. Thanks to the sophisticated automatic reverse transmission, gentle braking and reversing with simultaneous seat reversal and subsequent acceleration are very easy. The result is perfectly smooth asphalt paving with no bumps or hollows. Refuelling breaks interrupt the compaction process. To avoid them, Hamm has equipped the DV+ series tandem rollers with large water and fuel tanks. Filling is extremely user-friendly because the water can be replenished centrally from the ground very quickly via a pressurized supply of at least 14.7 psi as a standard feature. Because the tanks are linked together via communicating pipework, they are filled simultaneously. Connection to a hydrant is also an option. Alternatively, water can be gravity-fed from above in the traditional way via one of the four filling spouts on the top. Replenishment of diesel and hydraulic fluid is also conveniently arranged: both can be carried out from ground level. Despite the extensive machine functions, operation of the DV+ is intuitive and very quickly learned. The key to this is the innovative Easy Drive operating concept, developed by Hamm in collaboration with universities and experts in ergonomics, as well as roller drivers from different countries. At the heart of the operating concept is an ergonomically optimized operator platform with many inventive details. For example, the seat allows the driver to adopt a relaxed sitting position, facing in the direction of travel in all situations, as it can be turned mechanically by 90 degrees in either direction, and shifted to the left or right as standard. As an option, the seat can also be electrically shifted and rotated by up to 350 degrees. The height, suspension and depth of the seat – as well as the position of the armrests – also are individually adjustable, as is the steering column angle. Thanks to the wide range of adjustment options, drivers will quickly find a healthy sitting position in the DV+, whatever their physique. Another key feature of Easy Drive is its operating structure. A steering wheel is used for steering. All other important functions are operated via a joystick and the multifunction armrest. Here, the driver is able to see all the keys on the joystick. All other operating elements are arranged around the joystick in such a way that the most frequently used ones are placed closest to it. At the same time, the operation is designed to be entirely language-neutral. Hamm uses colour coding to achieve unambiguous assignment of the functions, and a clear overview. Easy Drive provides numerous benefits in and around the operator platform as well: a wide access way to the platform or spacious cab, foldable armrests (on request) or an easy exit with tiltable steering column. In this way, getting on and off becomes even easier and safer. Documents and personal items can be securely stored in the many compartments around the seat, and two 12 V sockets provide power for a cell phone or ice chest. Last but not least, in the optional cab, excellent sound insulation reduces noise levels from the already quiet engines. 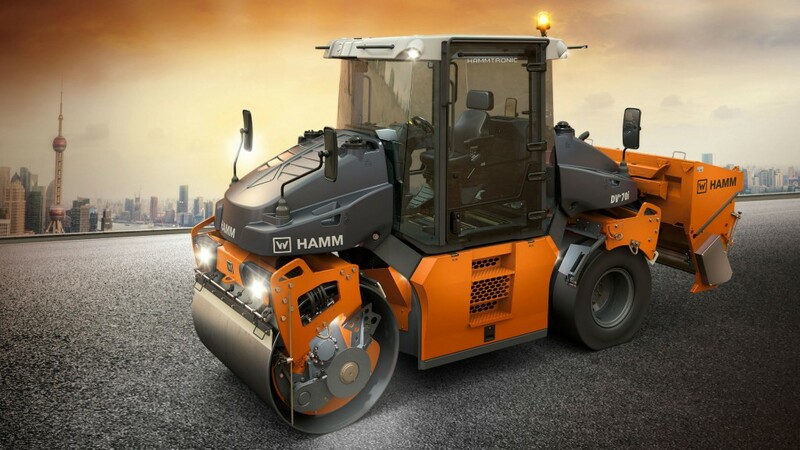 Hamm offers two versions of the DV+ for North America: with ROPS roof or with fully glazed ROPS panoramic cab. In both cases, drivers of the DV+ can enjoy an excellent view of the drum edges at all times. This has been made possible through the innovative design of the platform or cab and of the water tanks. A special feature is the glass viewing pane in the floor that allows an unobstructed view of the drums from above. On the models with ROPS cab, standard split doors ensure ample fresh air: the upper half can be rotated by 180 degrees, the lower by 85 degrees. When the door is closed, air is led through the window vents to the interior, and in winter, ventilation slots ensure speedy de-icing. All DV+ series models are equipped with state-of-the-art engines, satisfying Tier 4 / Stage IIIB emissions requirements. The power pack filters the soot particles with a highly effective diesel particulate filter as part of the exhaust gas purification. This means that the rollers are equipped with future-proof technology that can be used even in the most strictly regulated markets, such as California. The new automatic engine stop system can also be incorporated as an optional extra; it switches the engine off during extended periods of inactivity, saving fuel. Municipalities across Canada are burdened with aging transportation infrastructure, much of which was constructed in the post-war era and is nearing the end of its useful life. The 2016 Canadian Infrastructure Report Card (CIRC) found that one third of municipal infrastructure across the country is in fair, poor or very poor condition, and this includes 39 percent of roads and 26 percent of bridges. Cold weather and the use of corrosive de-icing salts further threaten the reliability of the transportation infrastructure we rely on every day.